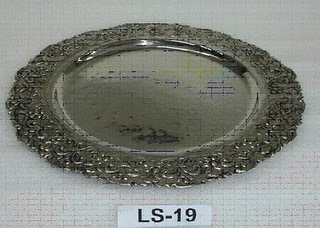 I've been thinking about how I want my tables to look at our reception. A lot. I am hoping to find awesome chargers on the cheap whilst in India. I know I'll have zippo time to shop because I'm booked with back to back appointments. However, there's an awesome handicrafts market called Dilli Haat (pronounced deelee hawt) that's open in the evenings that I'd like to try to get to. Considering the rupee is at the highest it's been in years, I can load up on some really great stuff on the uber-cheap. Last time I went to Dilli Haat I got rayon pashminas for US$1 each. Nice. You can get the real-deal pashminas for about US$30. REALLY nice. It would have a different finish of course, but this is just the raw body and pattern I would go with. What do you think? On top of the charger, I'd place the ivory napkins. The tablecloth is in sandalwood. Here's a pic of the table linens I chose. I'm going with "The Pocket." 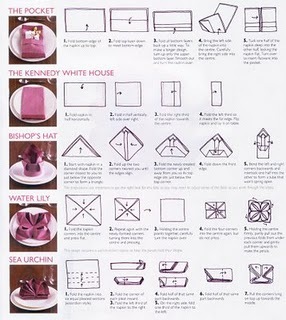 I can then put my brown favor box right on top of the fold part with the menu peeking out from under the fold. What do you think? OK, so check it out. 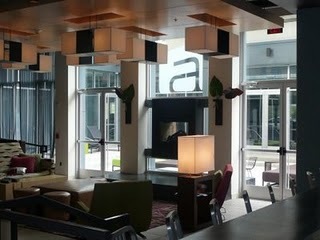 The Aloft Hotel opened up not long ago down in Cool Springs, about 15 miles out of Nashville. I work nearby and my company started using them when overnight vendors would come. 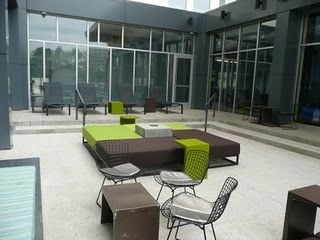 I knew I had to work with them and get a hotel block for my Out-of-Towners! 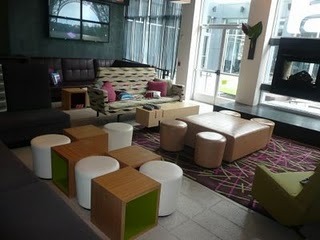 So, I hooked up with Kristen, the Sales Goddess at Aloft. 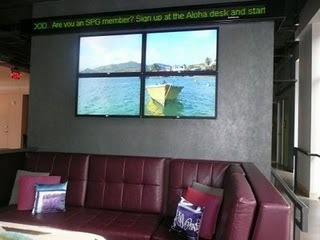 I met up with her the same night the hotel was doing this cool after-work wine tasting, snack eating thing. I mean, it was nice cheese and crackers and yummy tiny cookies and such. Snacks, but nice snacks. And the wine was good too (a local one!) and if someone would remind what it was, I'd be happy to sing praises. Anyway...The Candyman and I sat down and chatted with her about Bridal Blocks and such. 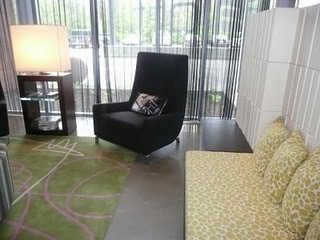 I like the lobby vibe there. It's cool and chic and new, but small so cozy feeling. We decided to have our Rehearsal Gathering there and I'm just totally psyched about it. I hope everyone comes. Since The Candyman and I are paying for this shindig, an additional Rehearsal Dinner would equal almost another reception and we just can't do it. We had been to a similar Rehearsal Gathering a year prior at James and Honni's wedding in Chapel Hill. I thought it was a grand idea. Most of our guests are from out of town and I think it would be hard to get everyone there on time for a rehearsal dinner the day before The Big Show. This way, people can come early, come late, whatever - just come! At any rate, Ashely over at Ashley's Bride Guide (Nashville's local resource for all things bridal) hooked up with Kristen too not long ago and snapped these uber-cool photos of the lobby. Check it out! It's got a very nice feeling at night. These day-time photos don't do it justice! 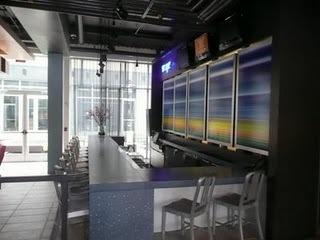 It will be a great place to mingle and chat everyone up and really socialize. I have a feeling I'm going to be a little freaked out 24 hours later. In a good way though - a "HOLY $H*T, I'm MARRIED to The Candyman!" way. And that will be a very, very good thing. Remember the love, people. Remember the love. We had our tasting at Mere Bulles about two weeks ago now. It went very well. If they can pull off what they did for me and The Candyman, I think all of our guests will be quite pleased! I know I will be! Here is the front of the house just as the sun was starting to set. I can't wait for the trees to fill in! I have to give props to Carlin McQuiddy at Mere Bulles for being the hostess with the mostest. From the start, Carlin was aces with me and The Candyman. We had never been to MB before our appointment. I had found the information in The Nashville Scene, our weekly indie rag. I liked the antebellum feel to it and the fact that it's about 10 minutes from our house. In the first 30 seconds of our meeting, Carlin asked us if we'd ever had their signature soup, a She-Crab Bisque. We hadn't and she promptly sent away a waiter to bring us back a cup. Well, if you feed The Candyman, you're putty in his hands, so I think he was sold with the first spoonful. While the soup is to die for, I needed a little more to the venue than good soup. A half-price Sunday price tag and the fact that I can bring in my own wine (plus a cork fee) and I was SOLD! We decided on passed appetizers during the cocktail hour and a sit-down dinner. Comparing the cost of a buffet style for appetizers and dinner, the price difference really wasn't that big, so we decided to go a little more upscale. Before we decided on the menu options, we did go there for dinner to taste-test a few things. To offer prime rib on our menu, there was a severe per plate price increase. Shane did a taste test on the prime rib and while it was good, he wasn't loving it to death - at least not enough to warrant the price increase per plate. The things is, most of my friends and family aren't beef eaters and totally would not miss the option. So, we opted for chicken, fish and a vegetarian meal. The fish choice was salmon. Now, I like salmon, I really do. However, I am extremely picky when it comes to my salmon. Extremely. Nine times out of ten if I even dare I order it, I'm disappointed. So, I wanted to sub another fish for the salmon. That proved to be a difficult task to maneuver at first. I blame myself for attempting the change via email. It really should have been a phone call or face-to-face discussion. *TIP* - If you have a change or request that is off the beaten path of your venue's course, approach the subject carefully. Be kind, be understanding, but be firm without being a giant B.
I think that I might have been a little on the annoying side, but I negotiate as part of my job so am used to irritating people to get what I want. While I didn't get the sea bass I was hoping for, I did get tilapia. Tilapia is a nice white fish that will adopt any flavor you give it, so I was happy with the option. 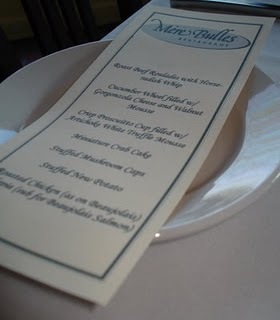 To start the tasting, Mere Bulles had set up a table for us with our customized tasting menus. So sweet! Our waiter McKenzie was completely accommodating and gave us wonderful service. We also met Kirby, the group events go-to guy on the day of. He was awesome and made sure we had all we needed. We had two pages of appetizers to choose from and for our tasting and we choose six to taste with the notion of choosing five for service. In the back we have Roast Beef Roulade with Horseradish Whip and up front we have a Cucumber Wheel filled with Gorgonzola Cheese and Walnut Mousse. 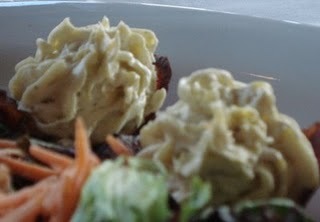 The beef was tender and the horseradish not too strong. The cucumber wheel was lighter than I anticipated and was really nice. 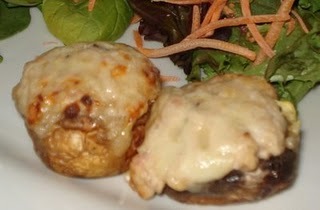 These are Stuffed Mushroom Caps, filled with Ham and Gruyere or Seafood and Brie. Hell yeah. 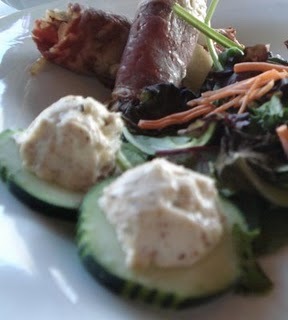 In the back are Stuffed New Potatoes with Bacon, Cheddar and Sour Cream. Um, yes please! 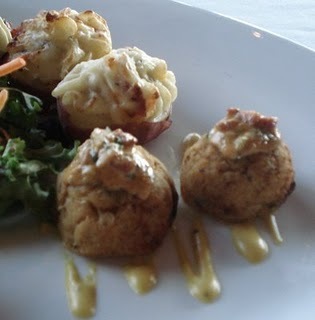 In the front are Miniature Crab Cakes with Spicy Remoulade. These were actually a little disappointing. We found them to be a little heavy on the bread crumbs, so a little gummy. Our families are all from the coastal Carolinas. There is no way in hell we could serve them anything but amazing seafood, so we decided to pass on these. These little gems were the most amazing things I've ever tasted - almost a meal in itself. These are Crisp Prosciutto Cups Filled with Artichoke White Truffle Mousse. I couldn't eat mine without a knife and fork (they are big and the prosciutto is crisp and hard to bite through) and we anticipate people having difficulty with these as finger food. However, they were so good, we decided that people just won't care. I know I won't! So I forgot to take pictures of the meal part of the tasting before I dug right in. I took some photos after I started, but have decided not to post. It's just kind of disgusting looking. Who wants to see my half eaten tilapia? No one, that's who. Suffice to say that the tilapia was better than I thought it would be and the chicken was good. I hardly ever eat chicken (it freaks me out, residual feelings from my hard-core vegetarian days, perhaps?) and I plowed through it with reckless abandon. It was good, OK? We are not serving dessert (hopefully I'll have a cake by then!) and Carlin is letting us sub the She-Crab Bisque as an appetizer instead. How cool is that? I've spent this after noon working on my veil. I think it's actually going to turn out! Once I"m done, I'll share my DIY veil!